Late blogversary post (with a book review and give-away!) - Stop staring and start sewing! This is a darling and clever book and everything about it is nifty! I found a copy at Barnes & Noble and was flipping through it (I'd already gone through the whole book in pdf format but there's something so nice about holding it in your hands). I told Joey to hold it up so I could take a picture of it (I really like the dimensions of the book, easy to hold on your lap) and he smiled so nicely but was wondering why I was giggling. Once he saw the cover he struck this pose (never mind he's a dude with a knitting book tucked under his arm). Anyway, cute cover! 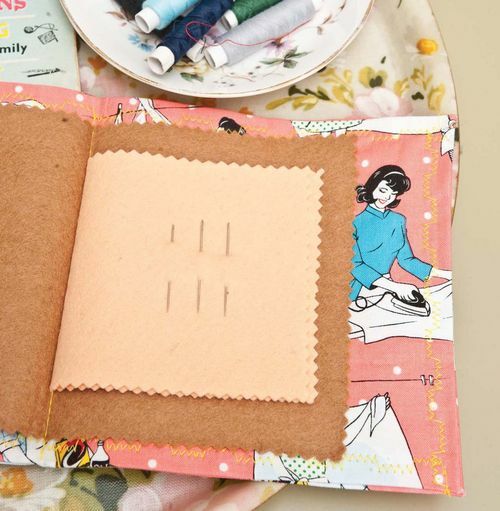 The premise of this book is very practical...you can make super cute and useful things even when you are a busy girl (I don't think they'd get angry if a guy used this book either...) without a lot of time to play. She even tackles the "not enough space" issue complete with pictures of smart little sewing spaces. 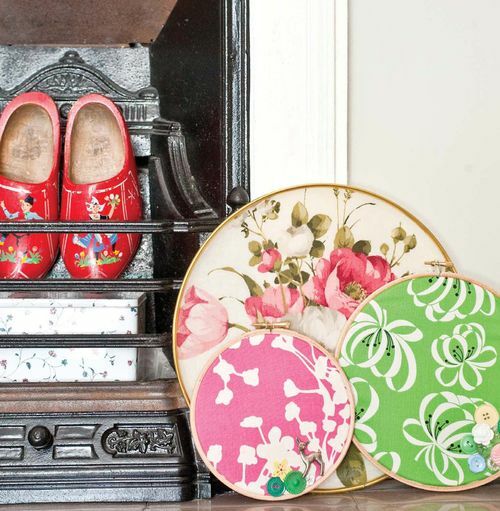 The projects are divided into "under 30 minutes" (some cute gift ideas! ), "under 1 hour", and "under 4 hours" so you're bound to find something for those snippets of time when you have a crafty itch. I love love love the pictures in this book and I would love to have it on my coffee table or even in the bathroom (for when I take a bath, really people....!!). 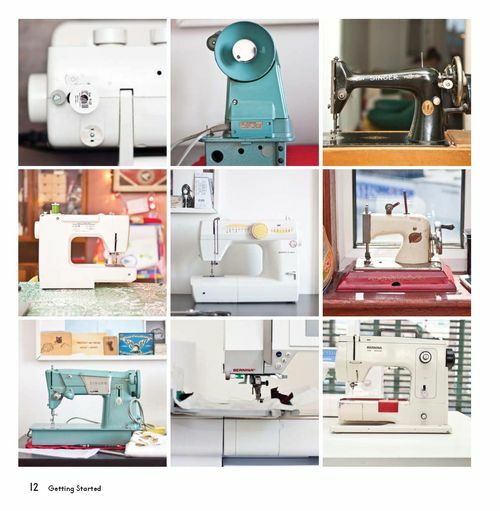 It's got oodles of retro goodness in it's 127 pages and even the pages with the more mundane sewing illustrations are fun to look at. The instructions are meticulous and the authors are very generous in giving the reader other project ideas to "stitch it up a notch". One of the best parts of this book is the chapter on making things to sell. The discussion on pricing your items is very helpful and she even includes smart advice on setting up a booth for craft fairs. I can easily recommend this book! It's pretty, practical, and inspiring. The team that worked on it looks like a fun bunch of gals and they did a meticulous job with the book. I was asked to recommend some shopping resources with my blog post and that makes me happy because I know a lot of great ones! Some of my favorite fabric stores are Above All Fabric, Sew Fabulous Quilt Shop, and Pink Chalk Fabrics, and for embroidery supplies you should check out Bari J. Ackerman's new embroidery supply store. These gals all have wonderfully stocked stores but, most importantly, they have great service and work ethic. 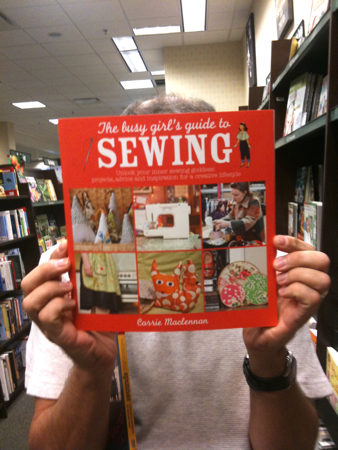 Okay, if you want a chance to win this terrific book just answer my question in the comments....the question is....have you started any Christmas/Hanukkah sewing? If yes, then what? If no, do you have any sewing plans for the holidays (please share!). Good luck (I'll draw the winner this weekend and send an email)!